Hi Guys, having a problem (or I think I have a problem) with a Hydro Level VXT 110V. Boiler seems to be getting flooded over a 12-24 hour period. Please see attached picture. The meter continues to read 0. I have a union on the feed line to the boiler. When I break it there's no water coming through. Just wondering has anyone ever seen these units feed water periodically and not register on the meter? 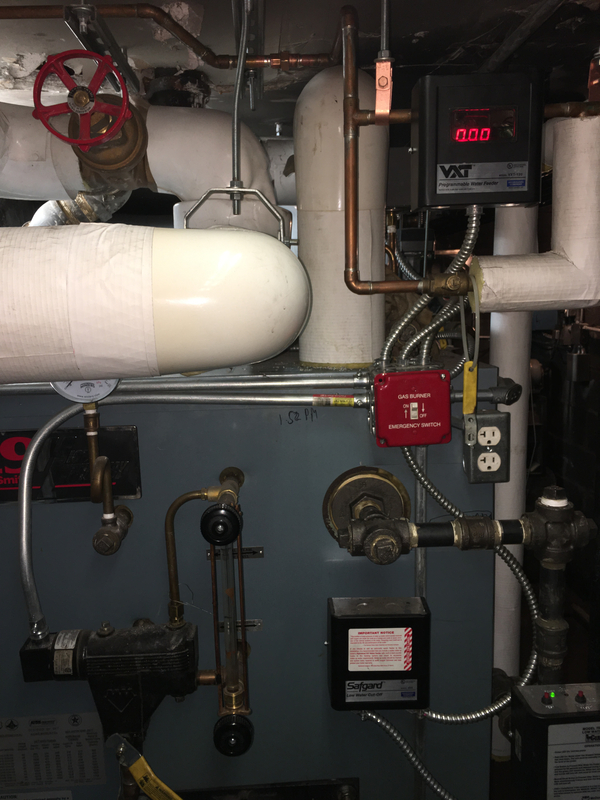 I've checked multiple apartments to see if I could find any other reason, but I cannot see where the boiler is getting the water from. If the boiler power shuts down momentarily, the feeder will feed momonetarily when it the controls power up again. Could the control wiring be wrong so as to cycle the power to the feeder with the T-stat or pressure control. When it should, I assume, be powered continuously? Feeding as Whisperer suggested. Is there a manual feed that bypasses the VXT? What kind of valve is on there? May be leaking past that valve. We need a better picture(s) of how the VXT is piped. I only see one valve with the handle removed and wire tied.